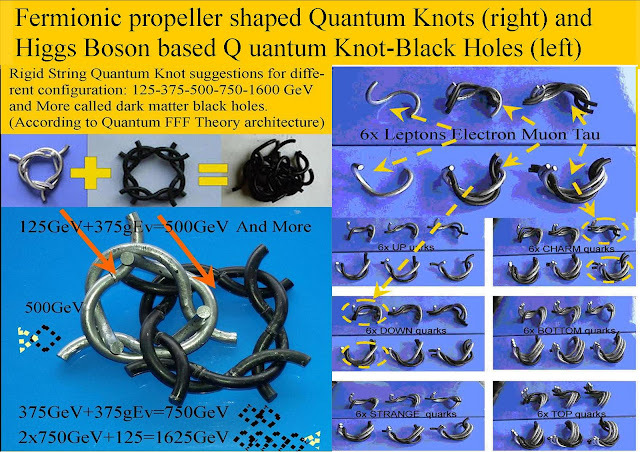 Rigid String Quantum Knots as a base for Bose Einstein Black Holes. 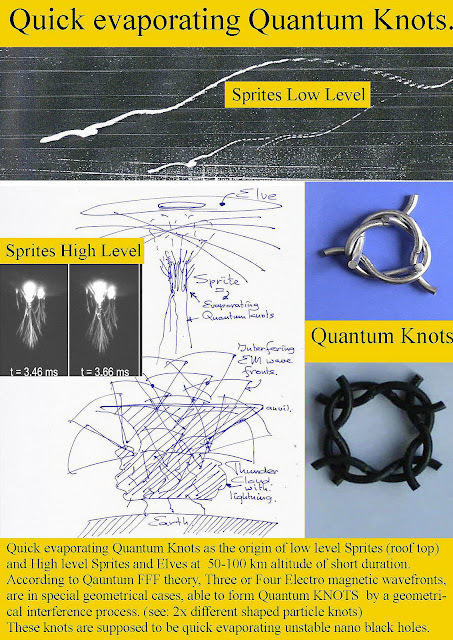 Created by 4x (X-ray) laser or/and 3x E.M. knotty interference. see: "4x and 3x Interference for Stringy Bose Einstein Black Hole production." 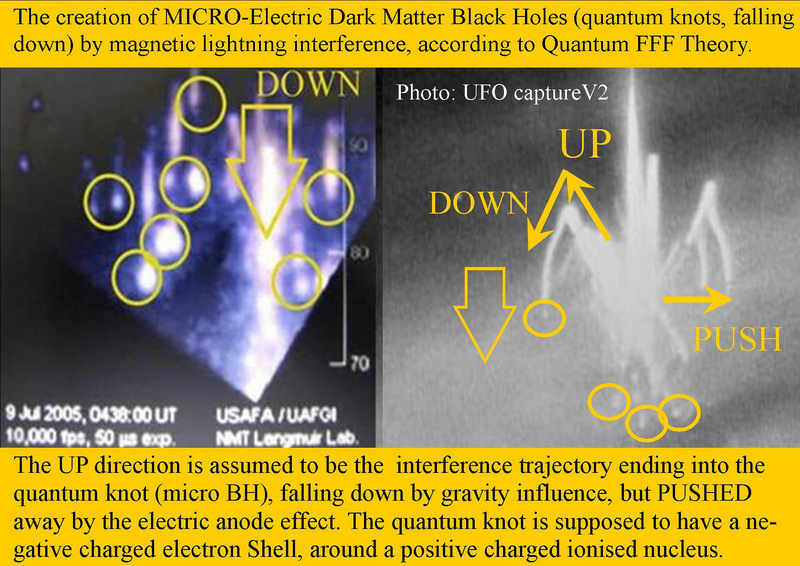 4x X-Ray laser interference or 3x E.M. interference should lead to Bose Einstein knots or (Fenmtosecond) unstable nano Black Holes. However a combination of both (X ray and EM) interference could become more stable black holes as observed as Sprites and Elves above lightning clouds producing Ball lightning or even micro Comets. 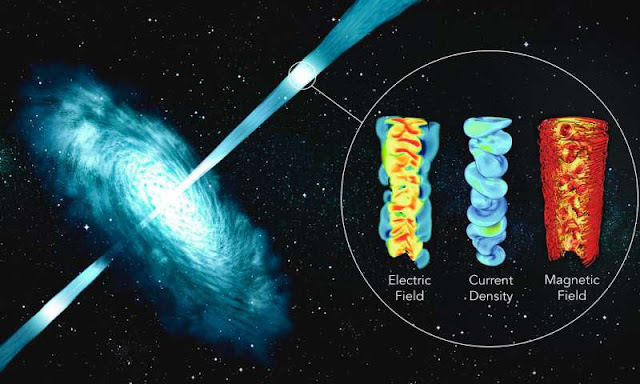 Energetic X-ray pulses from Linac Coherent Light Source (LCLS) X-ray free-electron laser at the Department of Energy’s SLAC National Accelerator Laboratory. Example of a micro high altitude Comet, a splitting semi stable black hole, pushed by plasma tail, which is assumed to be self produced by pair production at the BH horizon. 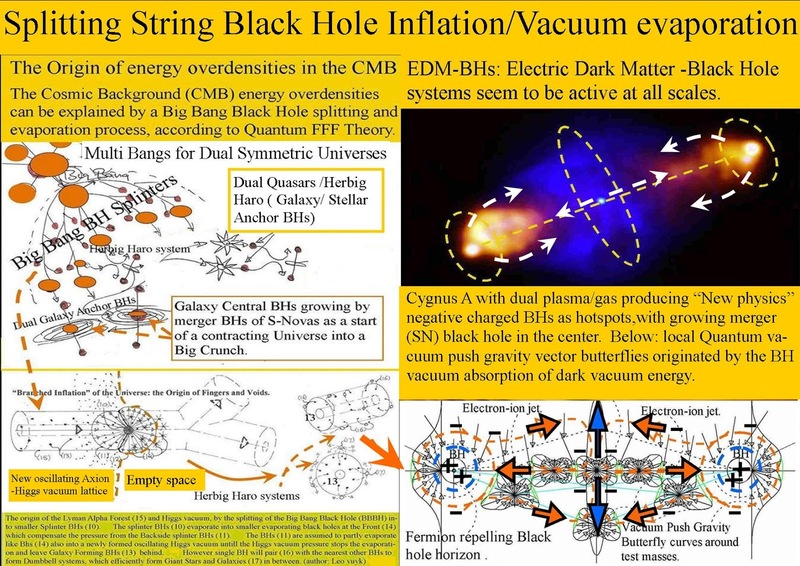 It is well known that both : X-Rays and EM waves are present at that high altitude: the asumed origin of complex String knot black holes. 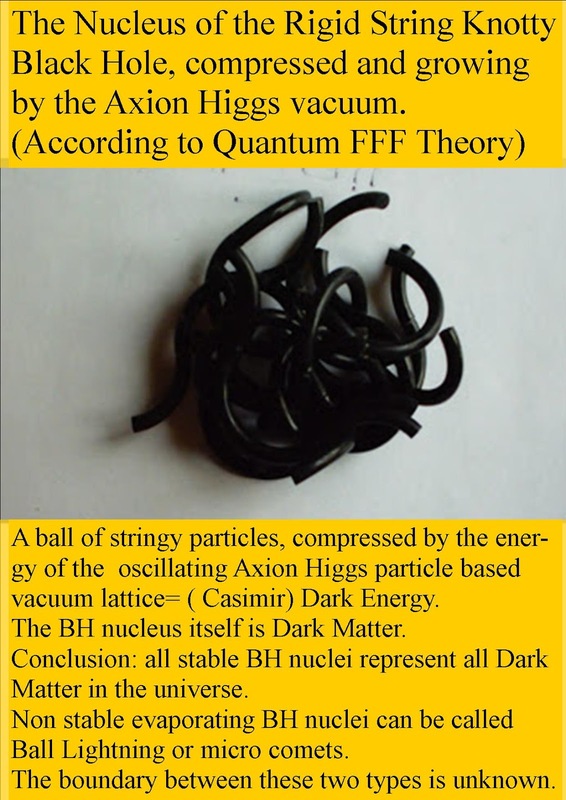 Quantum FFF ( Function Follows Form) theory is a Rigid String Theory postulating, that the vacuum is filled with a local variable Planck scaled lattice of oscillating closed torus strings called Axion-Higgs (AH) particles, analog to Dark Energy and the origin of Casimir effects. These AH strings are able to transform over 4x internal hinges due to real particle collision into different singular open Strings, such as the Electron and Positron or all Photons and Gluons. Photons and Gluons, Electrons and Positrons can wrap around each other, to form a series of compound Quarks or Bosons, well know as the “Standard Model” (SM) with new physics extensions like monopole photons. Model research on string form possibilities, show that only the single so called general photon and two monopole magnetic photons ( N and S) are able to form very rigid closed complex rigid string knots. 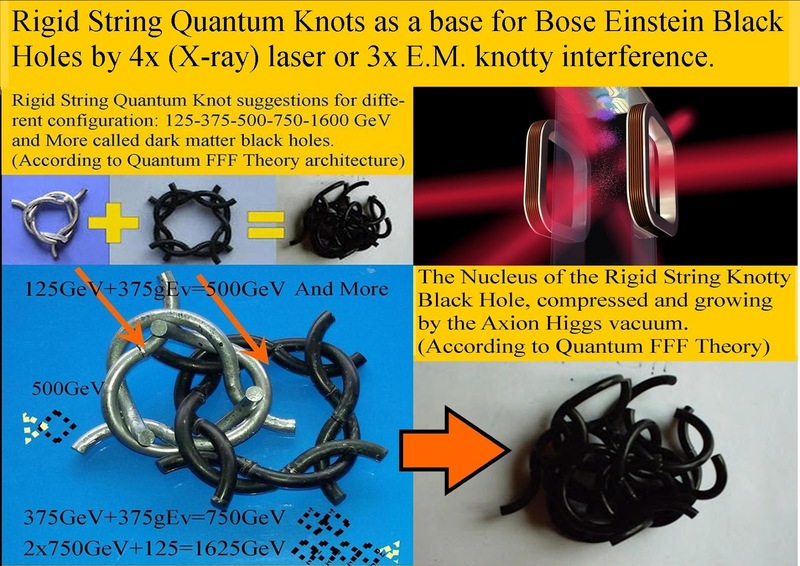 Three copy magnetic monopole particles ( North or South) are able to form two different ring shaped string knots, which are both called the Higgs particles possessing 124,5 and 126 GeV. 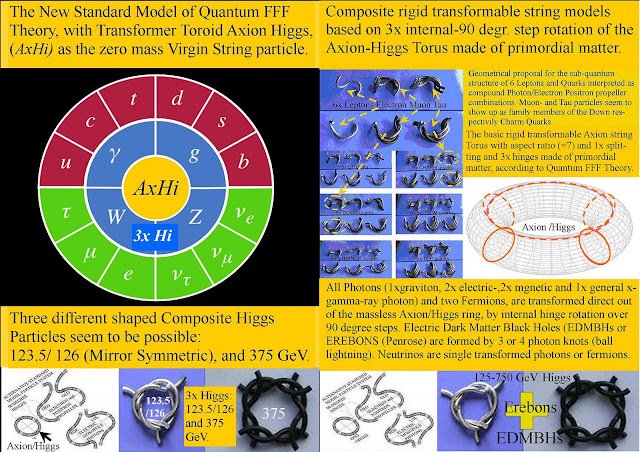 Four general photon copy strings however, are able to form a ring shaped knot which is also called Higgs which is assumed to possess more mass. 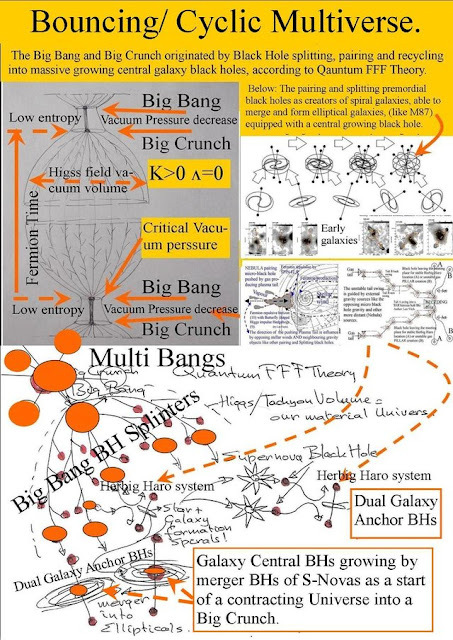 Indications of a third high mass Higgs particle are already showed up in the LHC at Geneva at about 375 GeV. 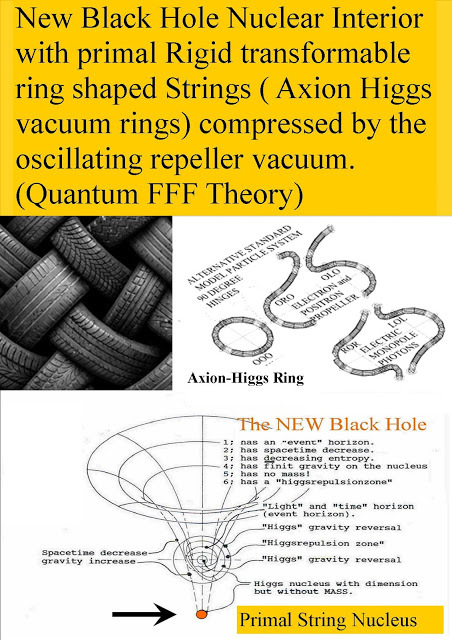 As a consequence of these ring shaped Higgs particles, I suggest, that the ring shape is a suitable form to connect with other ring shaped Higgses and form more complex compound black hole nuclei. 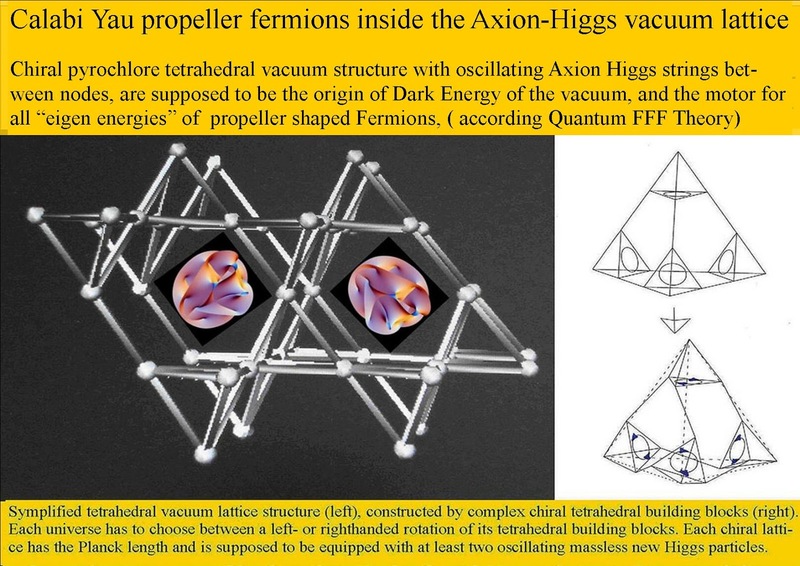 Such combined Higgs nuclei could be able to grow by laser- of magnetic interference into a more massive particle which can become stable and resistant for the vacuum oscillations after it has reached a certain minimum volume. The result is called a Bose Einstein stringy black hole, which can be compared with a Ball Lightning nucleus. The Fermion repelling black hole found inside Herbig Haro bowshocks. According to Quantum FFF Theory, attraction forces on fermions should be the result of the dual push effect of two opposing photon pulses, A: The general Axion-Higgs vacuum field pressure (dark energy) and B: The opposing incidental Graviton Photon produced by the collision of the Axion Higgs particle ( closed string) transforming into a Graviton (open) string travelling away with the local speed of light. As a consequence, only the result of two opposing photons impinging on Fermions has to count as a quantum force and the so called “Feynman diagrams” should be adapted accordingly. So, we may call this force a fifth force as it opposes and interacts or compensates all Photon/ Gluon pressure effects on fermions in the universe. how the quantum knot x-ray laser black hole looks like . 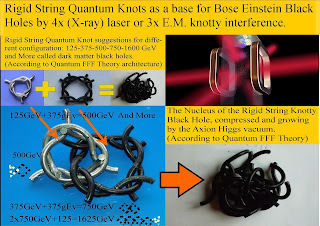 Rigid String Quantum Knots as a base for Bose Einstein Black Holes by 4x (X-ray) laser or 3x E.M. knotty interference. The one and only MULTI MILLION DOLLAR QUESTION in physics.! 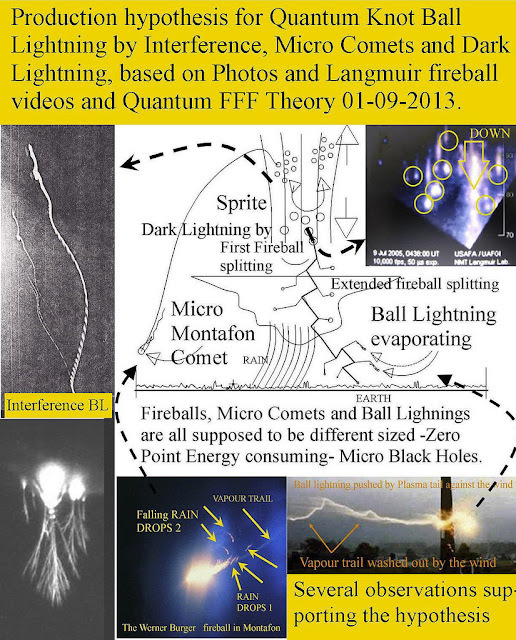 The MULTI MILLION DOLLAR QUESTION about BH plasma jets and discs. 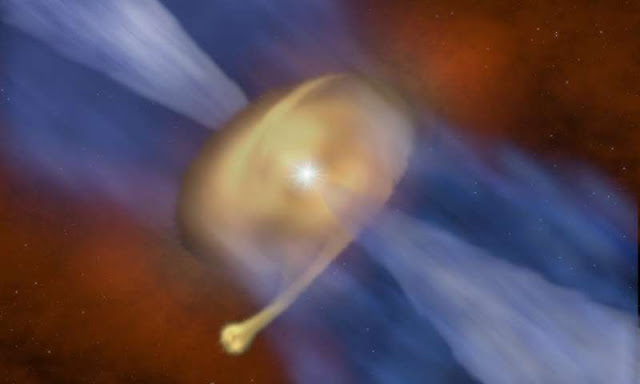 How the plasma jets and discs are formed without being sucked in to the BH. 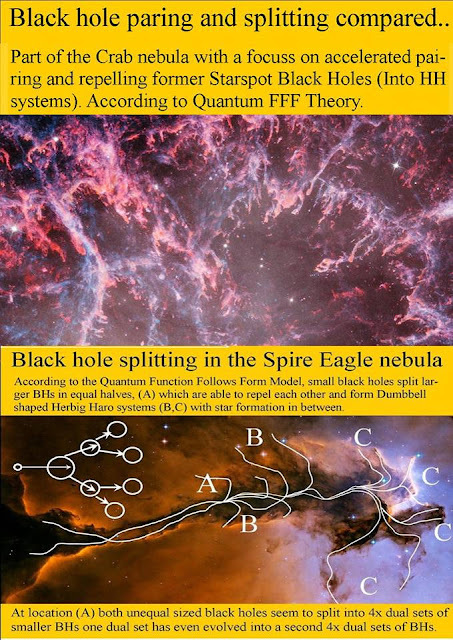 see: THIS "How to escape a black hole"
( HOW? due to Fermion repelling BH, by spin flip of positrons and electrons, according to Q-FFF Theory) ) see: Tidal Star Disruption Events (TDE) by Fermion Repelling Black Holes in Quantum FFF Theory. 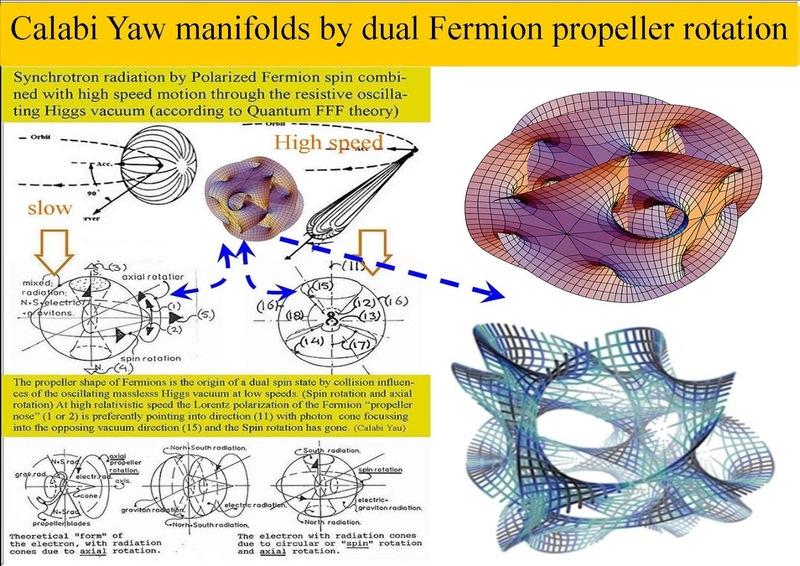 The gist of this effect is the multi million dollar question, because it shows the solution for all our energy problems and it is a clear quest for propeller shaped fermions ( or better a "rigid string theory"). 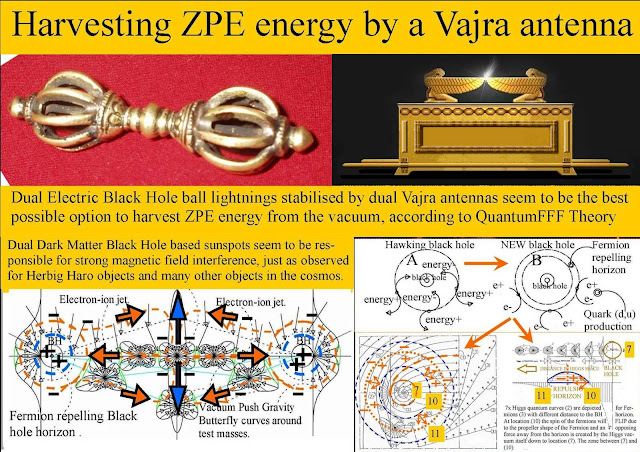 Parfrey said "even though it doesn't necessarily contribute that much to extracting the black hole's rotation energy," , "is possibly directly linked to the electric currents that twist the jets' magnetic fields." 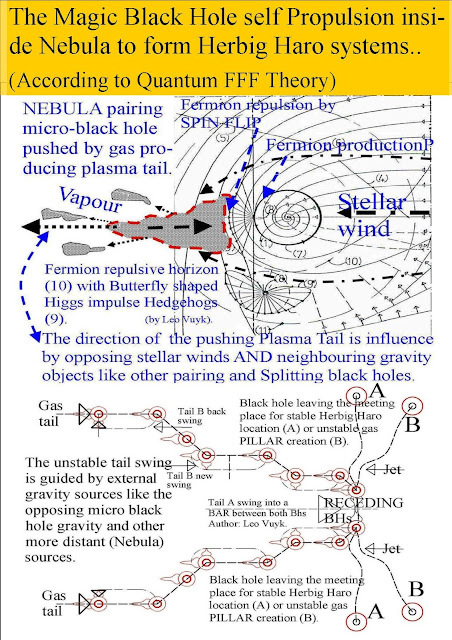 The team intends to better model the process by which electron-positron pairs are created in the jets in order to study the jets' plasma distribution and their emission of radiation more realistically for comparison to observations. "This has been a question for a long time." 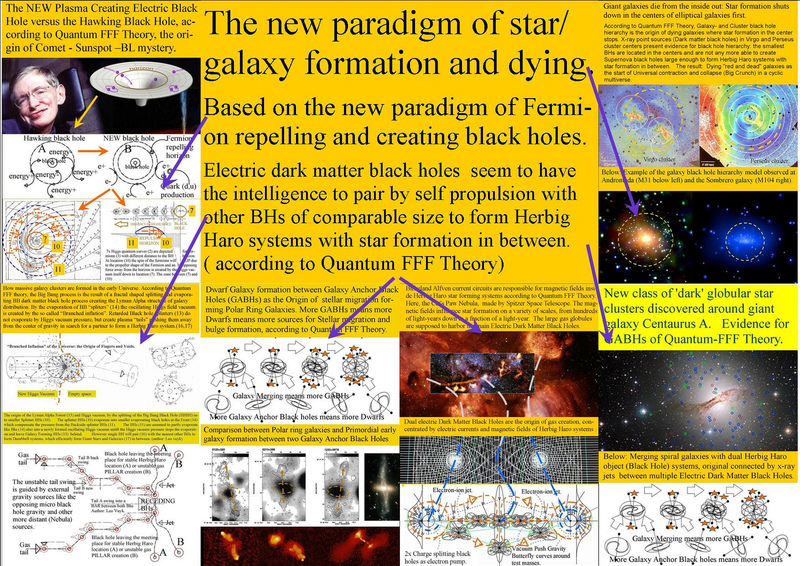 Tidal Star Disruption Events (TDE) by Fermion Repelling Black Holes in Quantum FFF Theory. 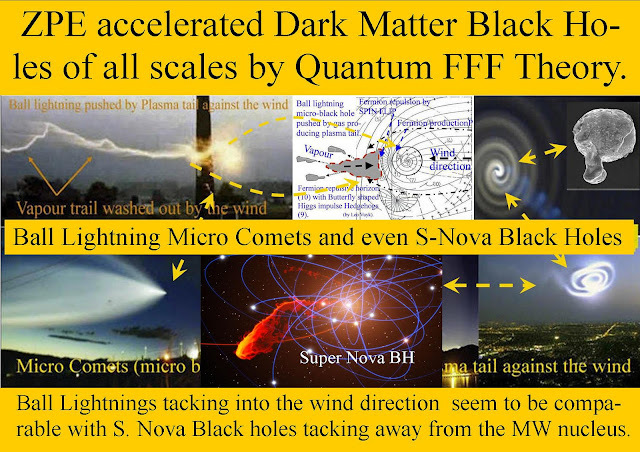 A new Space Drive by the impossible anti Maxwell effect. 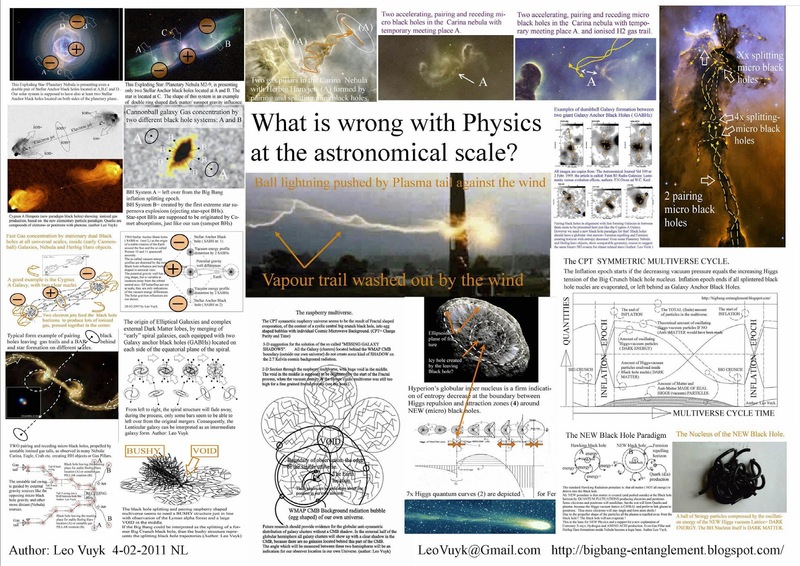 Magnetic Monopole physics seem to have a bright transportation future ! Even at school we learn that around a stationair current in a wire there is a circular stationair magnetic field. 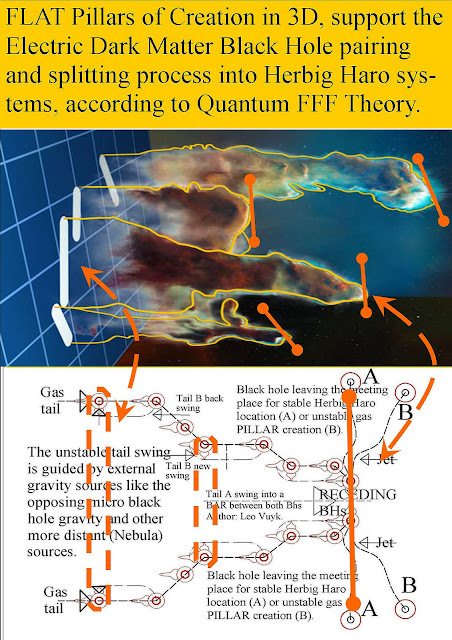 However we must also consider the new magnetic monopole model of Quantum FFF Theory, proving the liquidation or dipping of the field close to the wire. 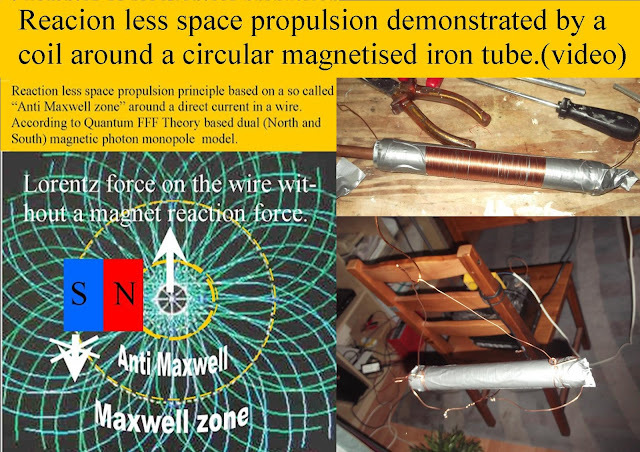 see Reaction less EM Drive Thruster by Anti Maxwell Dead Zone around a Wire. 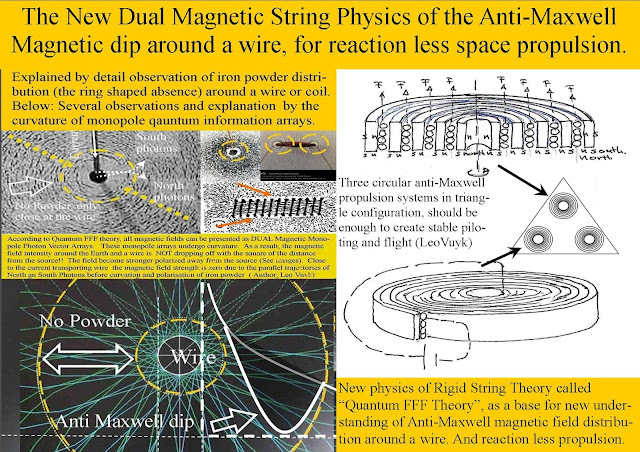 Even around a block magnet some monopole dip effect can be observed, leaving a circular surface free of iron powder.. Kitchen table test confirming free acceleration. The FIRST VERY MASSIVE BLACK HOLES created by Big Bang nucleus splitting ! 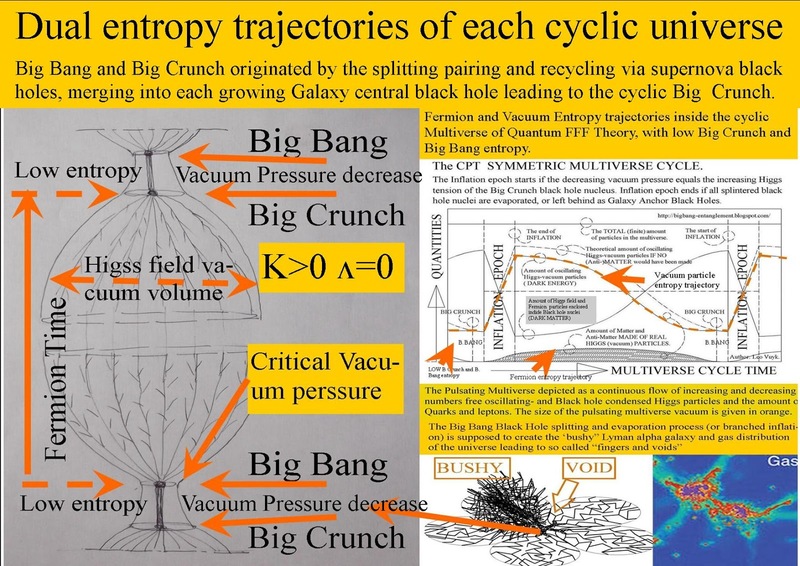 According to Quantum FFF Theory, ( Function Follows Form), the Big Bang/ Big Crunch nucleus was a giant stringy Black Hole nucleus or Quantum Knot..
A mysterious phenomenon called The Cow. 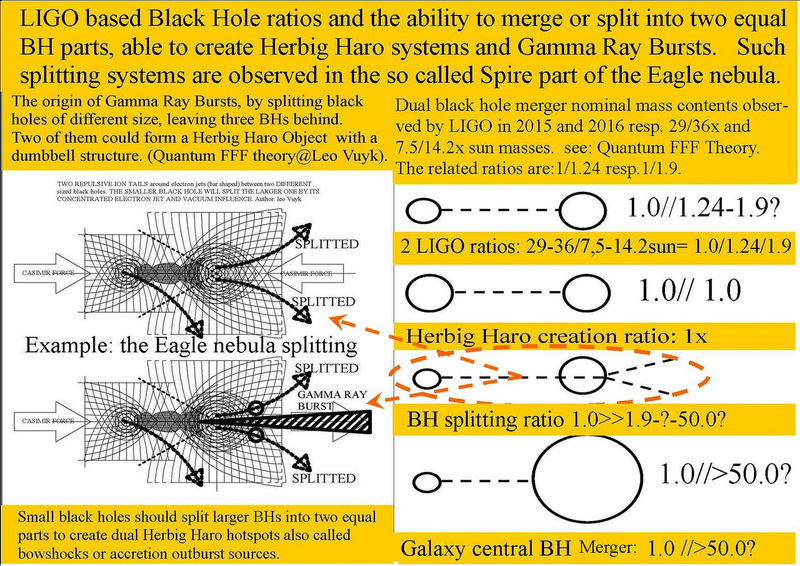 According to the new physics fermion repelling black hole of Quantum FFF Theory, this could be the result of a splitting black hole by a much smaller BH. 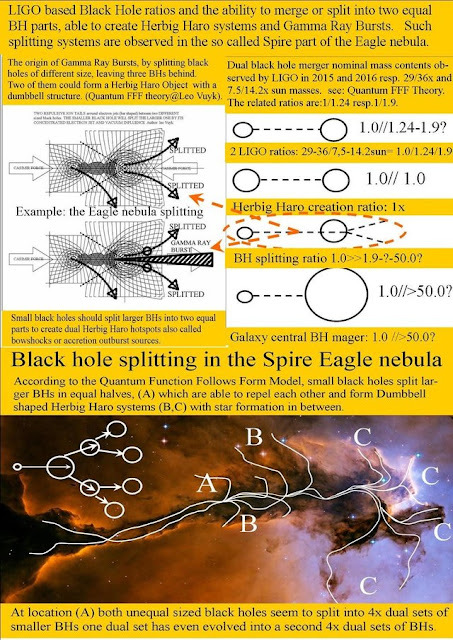 The result is two equal sized BHs forming the "bowshocks" of a a Herbig Haro system with quick star formation in between, and the splitter BH probably left behind or absorbed by the larger BHs. 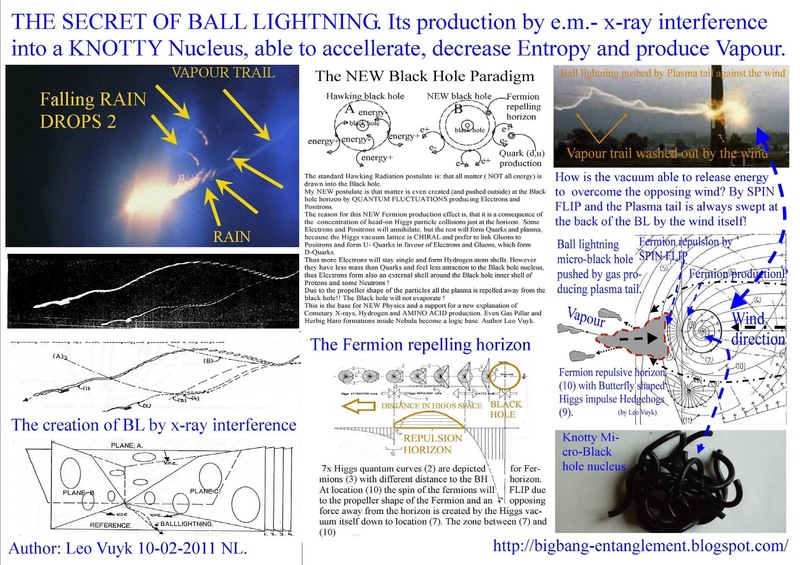 CO2 reduction by new physics small scale Herbig Haro electric ZPE energy systems, based on apparent violation of the second law energy, with two stable ball lightning like Fermion repelling micro black holes. Physicists stimulate Hawking radiation from optical analogue of a black hole. 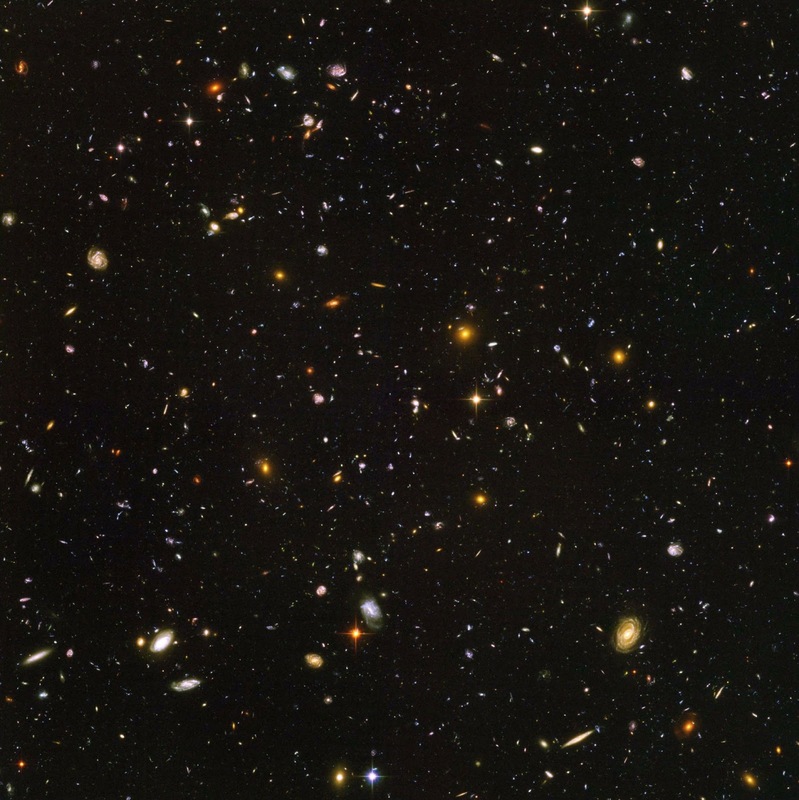 Bigger Galaxies with bigger stars, at the early universe. 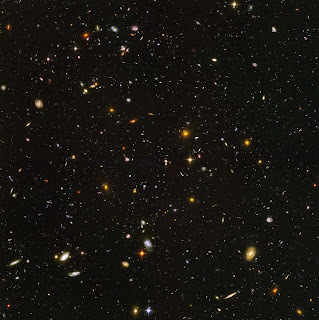 See: MUSE Hubble Ultra Deep Field Survey Confirms Puzzling Result. 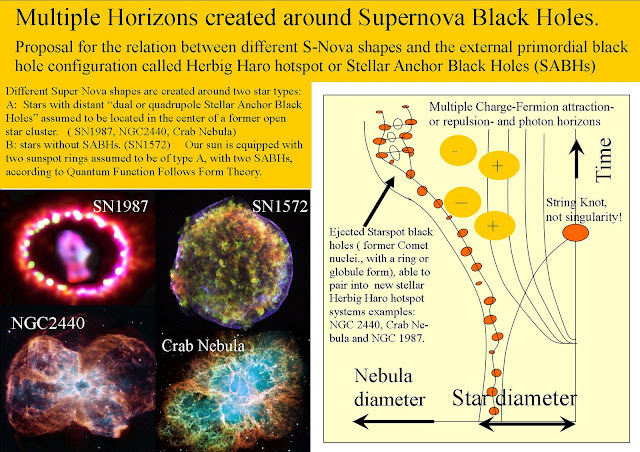 The conclusion they found is: lower mass galaxies tend to make smaller stars at a rate slightly slower than expected. NASA, ESA. Also According to Quantum FFF Theory, because the big bang was a black hole splitting process producing consequently smaller BHs and also smalle galaxies at the end of the splitting process. . see image. You need always TWO even sized black holes to create new Herbig Haro systems with new stars. The max. 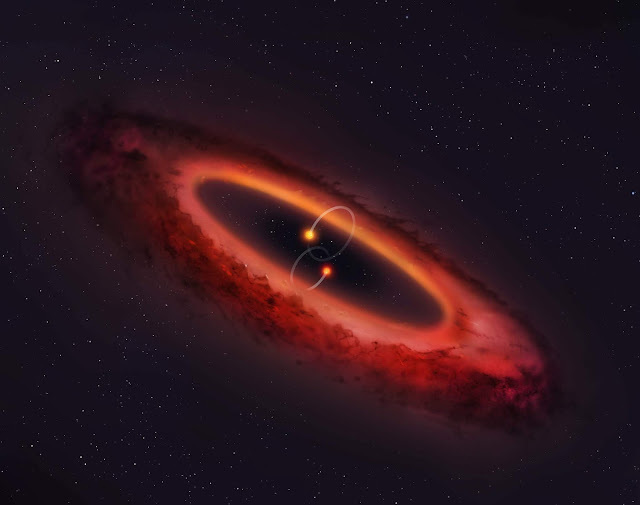 mass of these stars is evenly related to the mass of the two black holes we can find inside the so called "Bowshocks". 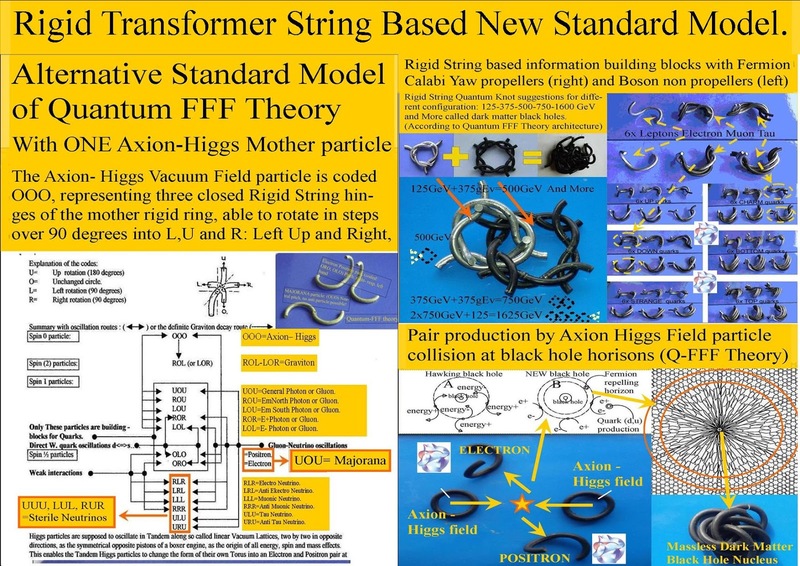 Transformable Rigid Strings create topology of supersymmetric Fermions, Bosons and extra monopole photons..
2; 6x Monopole photons for 2x magnetic and 2x electric radiation, one Graviton, and one General photon for all sorts of light ( optical, IR, UV, X-ray Gamma Ray) fields including 5 Gluons. 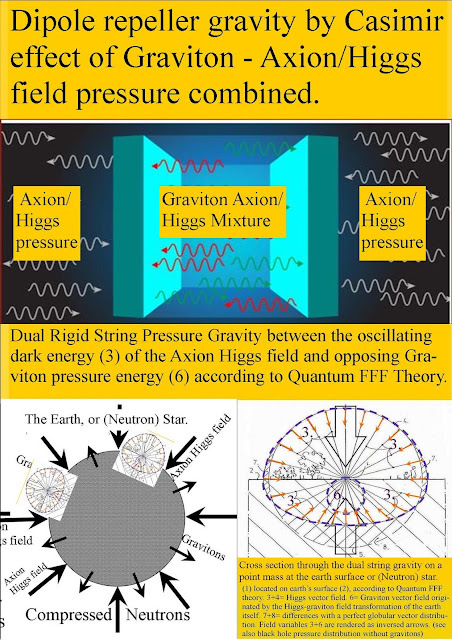 (The graviton is not assumed to have the same double function as Gluon inside the atom. 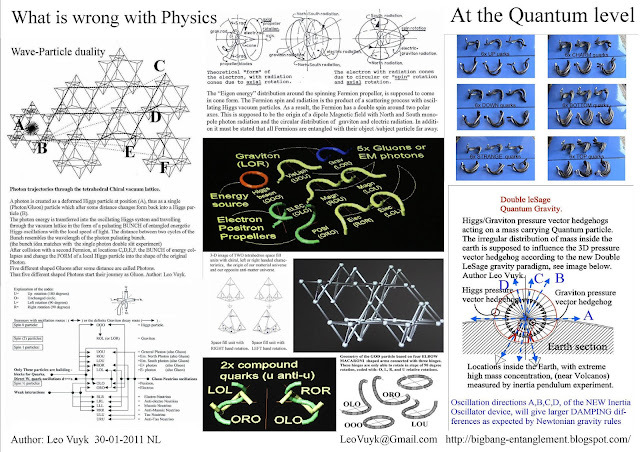 4: Compound rigid strings for Quarks, W-, Z and multiple compound Higgs particles. 5: Compound massless Black hole nuclei of all sizes up to the big bang black hole. see: The Massless Axion-Higgs Vacuum Rigid String particle, even in Micro and Macro Dark Matter Black Hole Nuclei. Equal sized Rigid String based New Black Holes do not merge but, form Herbig Haro systems. 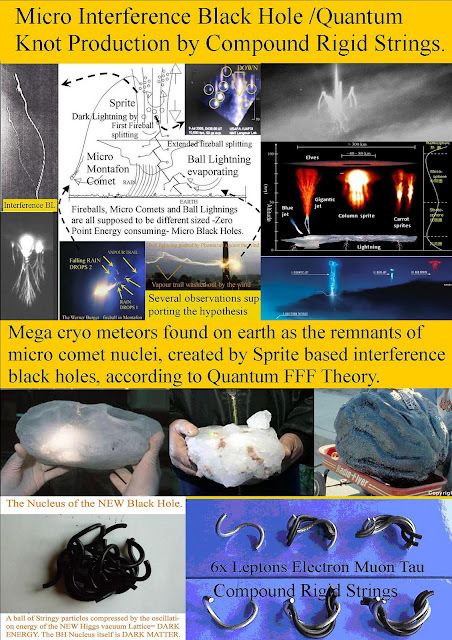 In Q-FFF Theory, equal sized Rigid String based Black Holes do not merge but, form Herbig Haro systems with a White Hole (also called Wormhole) in the middle as the center of plasma jet production. Q-FFF Theory postulates, that all rigid string based black holes (Bhs), with variable sizes, from semi-stable Ball lightning up to stable Comets, Dual Herbig Haro black hole bow shocks and even dual Galaxy Anchor Bhs, are negative charged from the outside and positive charged from the inside. 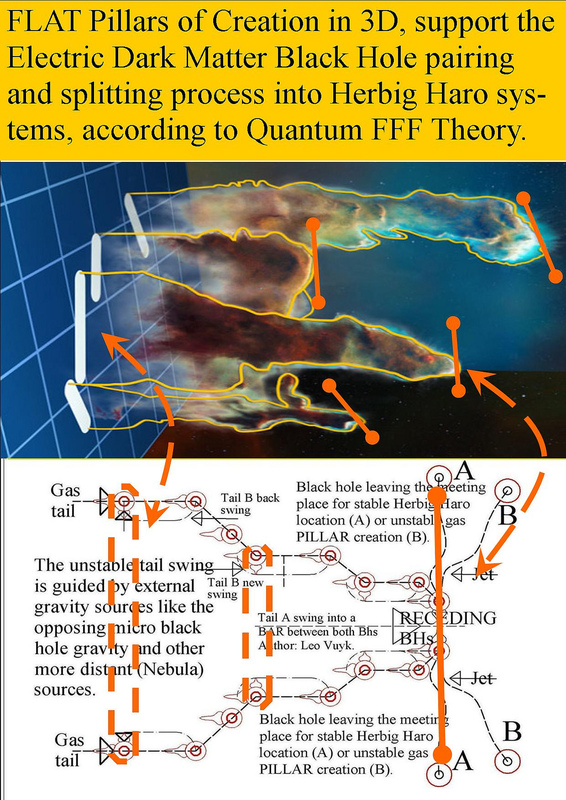 Q-FFF = Quantum Function Follows Form at the stringy quantum scale. 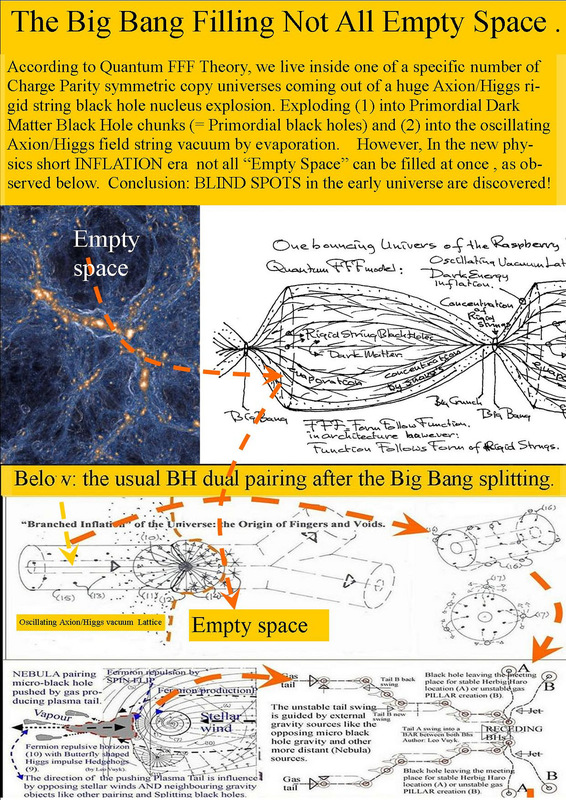 Below: the First evidence for the existence of a new physics dark matter based negative charged massless black hole ( described by Quantum FFF Theory) inside one of the bowshocks of HH 34. 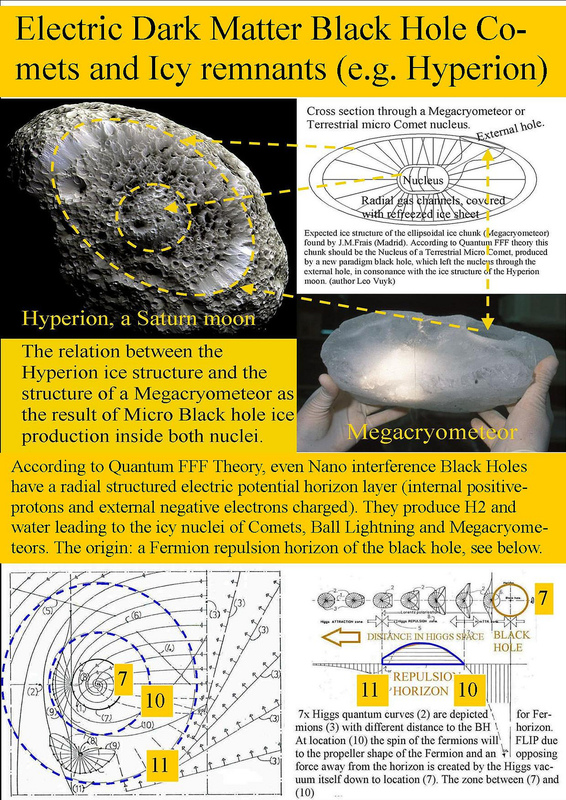 Found at the internet by Beuther and Fendt. 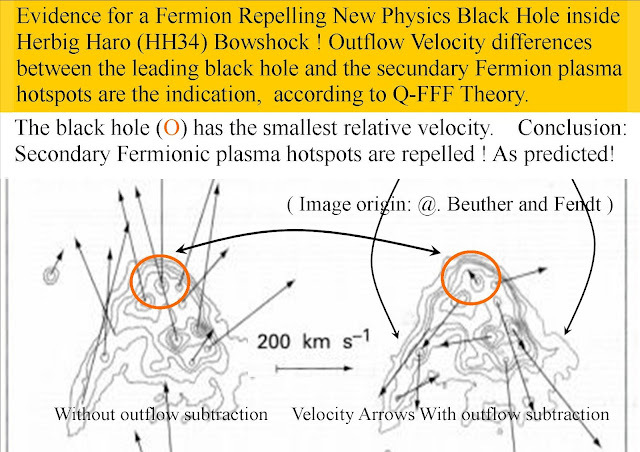 Called “Velocity Arrows With Outflow Subtraction”.